Juanita (Jennie) Candelaria (Saiz), age 97, born in Manzano, New Mexico and resident of Albuquerque, passed away Tuesday, October 30, 2018. 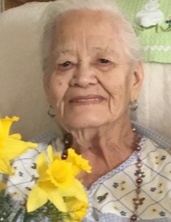 Mrs. Candelaria is survived by her children, Lugie (Lugarda) Garcia and husband, Adolfo, Lupe Baca and husband, Bert, Albert Candelaria and wife, Eileen, Teresa Garcia and husband Juan; eleven grandchildren, seventeen great-grandchildren, one great-great-grandchild; and cousin, Leonides Montoya. Mrs. Candelaria will be reunited with her beloved husband, Eufemio and grandson, Henry Baca. A visitation will be held Wednesday, November 7, 2018 from 8:00 a.m. until 8:30 a.m. at Holy Family Catholic Church, 562 Atrisco Dr. SW, with a Rosary to be recited at 8:30 a.m. Mass of Christian Burial will be celebrated at 9:00 a.m. Interment will follow services at Mount Calvary Cemetery. Pallbearers will be Adrian Aragon, Brandon Torres, Robert Torres, Juan Garcia, Steve Garcia and Carol Baca-Aragon. Honorary Pallbearers will be Santiago Candelaria and John Paul Garcia.